Grip: Combat Racing just got a massive update, adding four new tracks and game modes. Team racing is the focus of these: you can join red or blue teams in any mode, including classic race, ultimate, elimination, and speed demon, to add a new twist on old formats. There’s also an all-new team deathmatch in which red and blue teams compete to score points by blowing each other up. 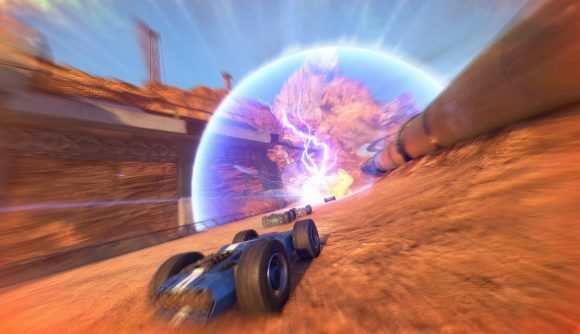 The new tracks take the game’s overall total to a muscular 27. The level cap has also been raised from 30 to 40, and more levels means more paint job and tire unlocks. The Pariah cars also get new colour-customisation options, and there’s a slew of bug fixes and track improvements. Overall, developer Caged Element calls this Grip’s “biggest update so far”. It’s live on Steam now (and, if you’re a console player – hello! – it’s coming to your platforms soon). If Grip has passed you by so far, you can get involved on Steam here for $29.99 (£24.99). And if you’re a racing fan, we recommend that you do – it’s honestly pretty awesome. Inspired by the late ’90s hit Rollcage, and made by some of the same developers, Grip is a fast-paced combat racer for those of us who miss Wipeout, or who wish we had Mario Kart on PC but with a cooler, more adult aesthetic. I personally loved Rollcage and Grip delivers the same sensation of speed, excitement, and tension as I approach the finish. It released into Steam Early Access in February 2016, and finally saw its full launch in November last year.